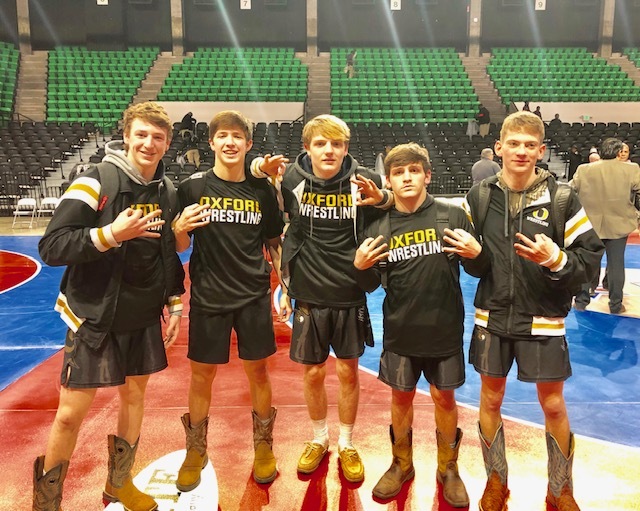 Here is Oxford’s Fab 5 — from left, Reed Hill, Chase Hicks, Jakob Chisolm, Wesley Slick and Landon Burrage — wrestlers who have been part of all three Yellow Jackets State Dual championships. BIRMINGHAM – Oxford wrestling coach Kyle Routon remembers every little detail of the match two years ago when the Yellow Jackets beat his then Southside team for the first State Duals championship. He will never forget the match Friday night when he finally won one of his own. 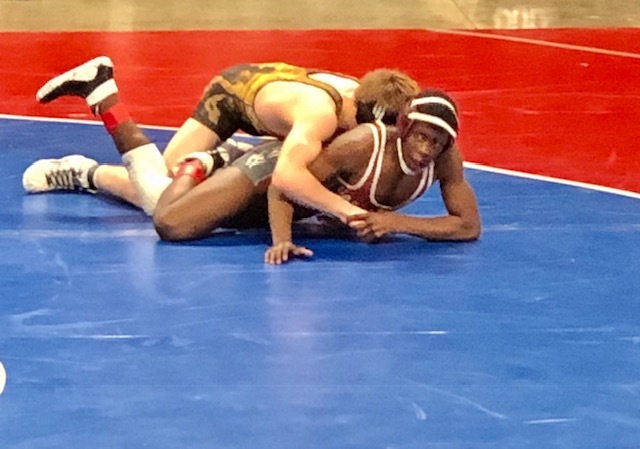 The Yellow Jackets won their third straight Class 6A State Duals title – and first under Routon – with a 42-27 victory over Gardendale at the Birmingham Crossplex. Routon has six state runner-up finishes in his coaching career (five in the tradition state finals, one in duals). Oxford has won all three 6A State Duals and is working on two traditional titles in a row. The championship run Friday came after the Jackets lost the first three matches – two by pin – and fell behind 15-0. They came roaring back with the six pack in the middle of their lineup, winning all six matches to go ahead 25-15. Kaleb Shelton (120) and Chase Hicks (145) both scored first-period pins; Landon Burrage (126), Wesley Slick (132) and Reed Hill (152) all scored decision and Jakob Chisolm (138), who clinched the title two years ago against Routon and Southside, scored a major decision. Burrage, Slick, Chisolm, Hicks and Reed are the Fab-5 who have been a part of all three Duals titles. Tristen Latham moved the Jackets closer to their three-peat with a pin at 170 and Octavius Adair clinched it with a tech fall at 195. Kobe Shumaker wrapped it all up with a pin at 220. And now he finally has his one. Oxford’s Wesley Slick (top) works on Gardendale’s Devyn Scoggins on his way to a 14-7 decision in the State Duals finals.